I’m currently rewatching Mobile Suit Gundam, following along with Mobile Suit Breakdown’s ongoing journey through the series providing historical and cultural context and background. At some point in my rewatch, it occurred to me: both MSG and Battlestar Galactica both came out in 1979, and have an incredibly iconic villain robot with a glowing red, single sweeping eye. The mono-eye. So, of course, I decided I needed to discover more about their shared visual idiom. 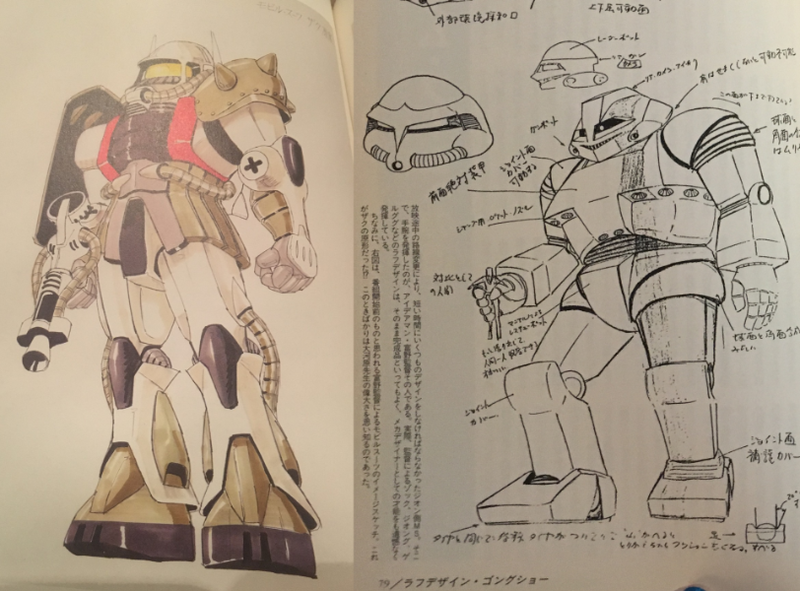 So, the usual story that gets tossed around about where design for the Zaku came from is that Tomino gave Okawara free reign to design it how he liked. The toy sponsor, Clover, wasn’t intending to sell Zaku toys, which meant that they weren’t being watched like hawks for marketability (and yet… it’s one of the best selling gunpla models, says me, based on very casual observation). The only stricture Tomino reportedly gave Okawara was “give it a monoeye”. For “Mobile Suit Gundam” the “Zaku” was originally not meant to go on sale so I was given a lot of freedom with the design, I had a lot of fun designing it. Director Yoshiyuki Tomino only had a single design request for me and that was the “mono-eye”, other than that I designed the [sic] everything else myself. I had complete freedom. All Tomino wanted was a mono-eye, everything else after that was entirely up to me. Before coming into this industry I worked with apparel, so the Zaku had a business suit sort of design. After hearing from Tomino about the mono-eye, it took me only about a week to turn around a design. The second draft became the final draft. They really let me do whatever I wanted. 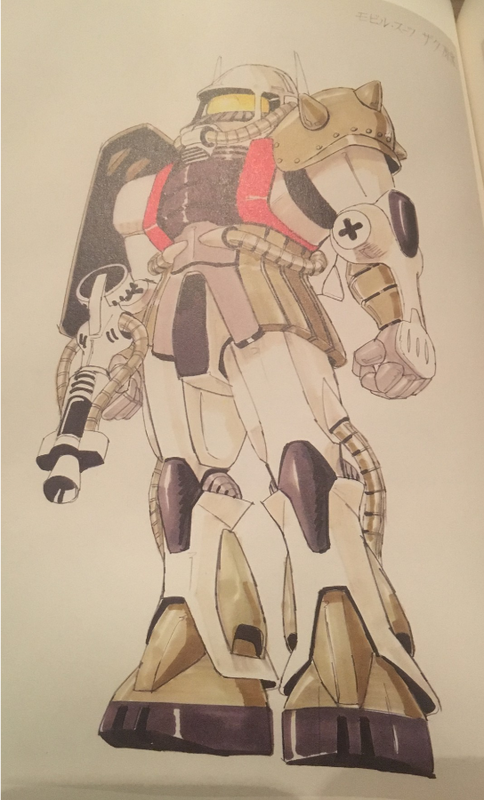 A very early Zaku design showing two eyes… also, can you imagine if the Gundam had batwings??? why did Tomino insist on the monoeye? given so much freedom, where did Okawara pull inspiration for the Zaku from? Unfortunately, these are usually too general for our purposes, although their insights into Okawara’s approach and attitude (which is delightful–he just loved to do the work he was doing) are useful. Trying to find out exactly where the Zaku’s design sprang from, and whether it was related to the Cylon, led me down a rabbit-hole trying to find out the origin of this eye. Was the Zaku copied from the Cylon? The other way around? Do the two share some referential DNA? I ended up importing some very cool Gundam art and design books, some very old sci-fi magazine back issues from Japan, and spending a good chunk of time researching robots in film in my search to find out. I’m going to take a somewhat meandering tour through this, but I think it’s the order that makes the most sense. First things first, in case you haven’t seen either the 1979 Cylon Centurion, or the Zaku, here we are. I’m trying to work with primary sources wherever possible, but… it’s a little hard considering I don’t speak the language. I’m relying a lot on a wonderful community of fan translators, Google translate, Chrome’s built-in translations, and a few other things. I’m also falling back to secondary sources where I have to. There are also a lot of accepted stories around that don’t have good documentation. Things like Char being named after Charles Aznavour, who was very popular with women in Japan at the time, have some credibility, but can still be hard to authenticate in the way they’re usually told. Also, it’s worth noting that Tomino is notorious for contradicting thing’s he’s already said, as well as commonly accepted critical stances (like that the Gundam is inspired by Samurai armor…). Basically, this can all get a little grey. But we’re going to do the best we can, ‘kay? Okay! I spent a long time putting search terms into engines in some combination of “zaku”, “gundam”, “battlestar”, “cylon”, “monoeye”… without much luck. The good thing is that this eventually lead me to that Zimmerit.moe article I mentioned, which was a great read on the general history of the Zaku. I highly recommend reading it. The Zimmerit article is great, but is more interested in tracing the ongoing history of the Zaku and its ongoing impact on Gundam, and Japanese pop-culture in general than the specifics of the design’s roots. There are also a scattering of fan-translated interviews with Okawara, but if the origins of the Zaku ever come up, they generally rehash the usual story (which is incomplete!) of where it came from. I eventually resorted to buying random art and design books on Gundam from Mandarake, which, if I’m honest, was financially irresponsible (but now I have awesome Gundam stuff), but I got lucky and got a hit reasonably early on with an interview and an old magazine ad for Barbarella (yea, the Jane Fonda movie). I’ll get to that in a second. Gigan from Godzilla vs Gigan (1972). I do want to say briefly at least about Gigan that the fact that it’s a Gojira baddie, is interesting. It gives it a certain… relationship to nuclear explosions and WWII. This I think is important–the Zaku is a nuclear-powered machine, and we see one go critical in the first two episodes of Mobile Suit Gundam, catastrophically destroying Amuro’s home colony in Side 7. But, like Harryhausen’s Cyclops, I’m still going to mark this one off as being the kind of coincidence that happens when people creating popular culture also happen to consume popular culture. 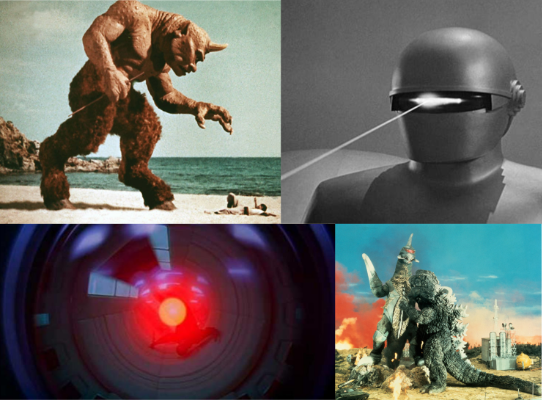 HAL and Gort though… I think we have a little more to work with here. Gort’s red eye isn’t a discrete circle (and technically we can’t know that it’s red either from this clip), and it doesn’t exactly sweep, but it still has what I think, over the next 30 years, would evolve into the Cylon’s sweep. It’s not a shot-for-shot recreation of the Gort scene… but there are a few strong similarities. Both of these eyes convey a sense of foreboding. Gort delivers on this shortly after the shot on its eyes by attacking, but the Zaku takes a little longer… though there is good argument that the visual design of the Zaku has some antecedents in Japanese modern history that would have telegraphed to its Japanese audience that it was “Not A Good Guy” already after that first shot (more on this in a minute). On the left: the stargate from 2001, on the right: Newtype Space from Gundam. Not an exact replica, but the construction of a color pipe creating a far away focal point that draws the eye is definitely an echo. Considering what else Gundam inherits from 2001 visually, and the movie’s prominence in sci-fi, I think that Tomino had this in mind when/if he said to Okawara “just give it a monoeye”. This is one of those connections that relies on a careful viewer, since there is little to no documentary evidence of it. But. I’ve been talking a lot with Thom, one of the hosts of Mobile Suit Breakdown (and a very good friend from forever)4 about this research I’m doing. 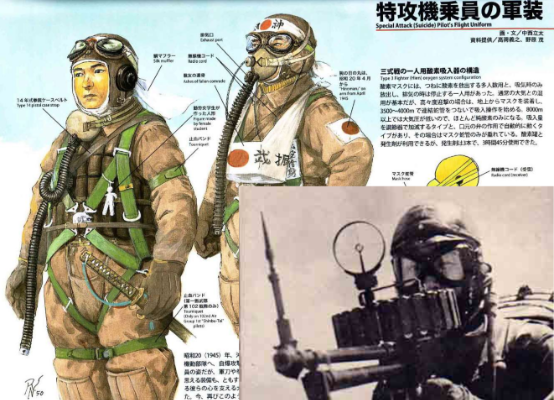 I don’t know about you, but that mask on the flightsuit illustration looks a lot like Okawara’s early Zaku sketch. There’s something about the angles of the brow and cheeks, and the sharp separation of the eye areas that makes it an expressive mask. Also, and it has to be said, that red sun on the pilot’s headband could easily be mistaken for the glowing red eye of a familiar mobile suit. I really think Thom is right with these two. Their sharp historical connection would certainly work to tie the Zaku to the role of aggressor in a Japanese audience’s mind (whether that makes them the villains is a political question that… is sadly still in play). 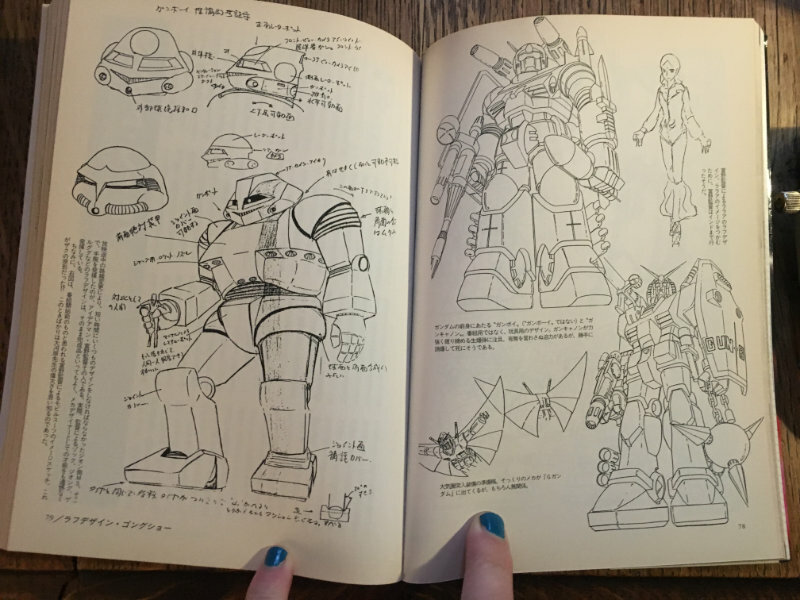 I’m about to jump into a visual source for the Zaku that I have some good documentation for, but that doesn’t exclude these visual references. We’re going to wrap back around to this, so just keep these in mind. Kunio Okawara, the mechanical designer for Mobile Suit Gundam, had a retrospective exhibition in Japan in 2013. As with many of these, an exhibition companion book was published, Kunio Okawara: Legend of Mechanical Design. 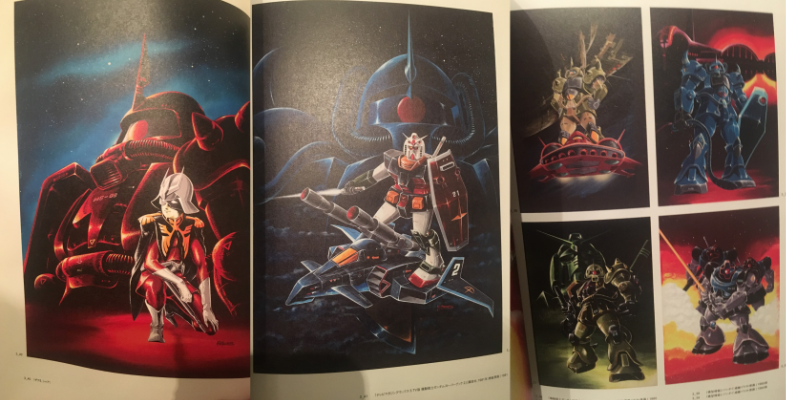 This books is gorgeous, and has some very cool prints of some early Gundam designs, as well as designs for Daitarn 3 (the show Okawara and Tomino worked on together before Gundam), and later Gundam series. Oil painting concept art by Okawara for Mobile Suit Gundam. Also, it’s hard to take good pictures of books you’re afraid to bend or damage. Q: …I understand that the original idea for Zaku came from a poster for the film Barbarella that appeared in the first issue of Starlog magazine, and that you were also inspired by the enemy knight Blackguard. Okawara: At the time, the enemy characters weren’t being turned into merchandise, so you were free to do whatever you wanted. And the [anime director] Yoshiyuki Tomino didn’t ask me to do anything in particular. I even got the okay to do asymmetrical designs, which were hated at the time. This was what led the Zaku to be a character. Creating Zaku also allowed me to discover the approach used for Zeon armed forces. First, I love that he calls the mechanical designs characters. I think it’s a very smart (and correct) point of view. Mobile Suits aren’t all that different from masks in theatre, which do a huge amount of work to communicate character. Second, I just want to call out that this report of Tomino having no instruction is contradicted in other sources (notably Gundam Age), though these kinds of contradiction are honestly everywhere. The truth is likely some combination of them. Third, it’s pretty cool that the entire Zeon aesthetic spun out of this one MS. When I first read this it didn’t really hit. Then I reread and freaked out. I’ve tried to figure out which “Blackguard” this is referring to, but haven’t had any luck. Final Fantasy wouldn’t be released for several years, so it’s not there, and as far as I can tell there is no “Blackguard” in the first editions of Dungeons and Dragons, which had made it to Japan at this time. It’s been a dead-end for me, so I’m leaving it be. 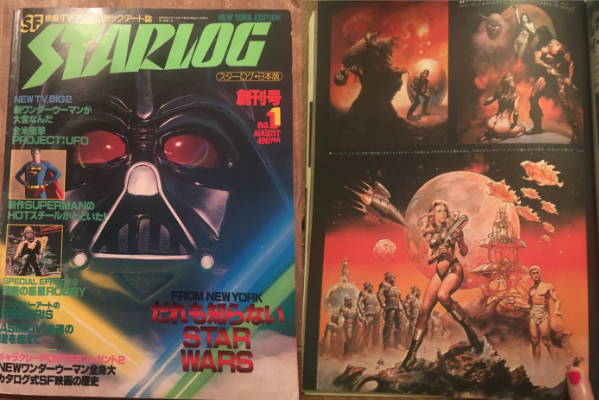 The holy grail: the first issue of the Japanese edition of Starlog. Cover on the left, Barbarella art on the right. Getting this magazine issue in the post was far more exciting than it had any right to be. I can’t read it, the print quality is… old, let’s say, and all of the content is 4 decades out of date (though I have wondered what would happen if I tried to send away for the mail-order geek-gear advertised in the back pages). And yet… this is a piece of Gundam history, and I am nothing if not a giant Gundam nerd. It was thrilling. But back to business. You see those angry-looking dudes in the armor on the bottom left over there? Yea. That’s the Zaku’s grandpappy. I’m going to point out some relevant design elements that show up on the Zaku or elsewhere in Gundam. I think it’s also interesting that in the recent interview Okawara mentions the influence of the business suit on the Zaku’s design. I can kind of see that dovetailing with the Barbarella baddie. If you do an image search for “1980 business suit” you get a lot of images where the suits give the impression of a slight cinch at the waist, which has the effect of visually broadening the chest. Looking at this Zaku design, and the Barbarella baddie, I can see some visual rhymes. 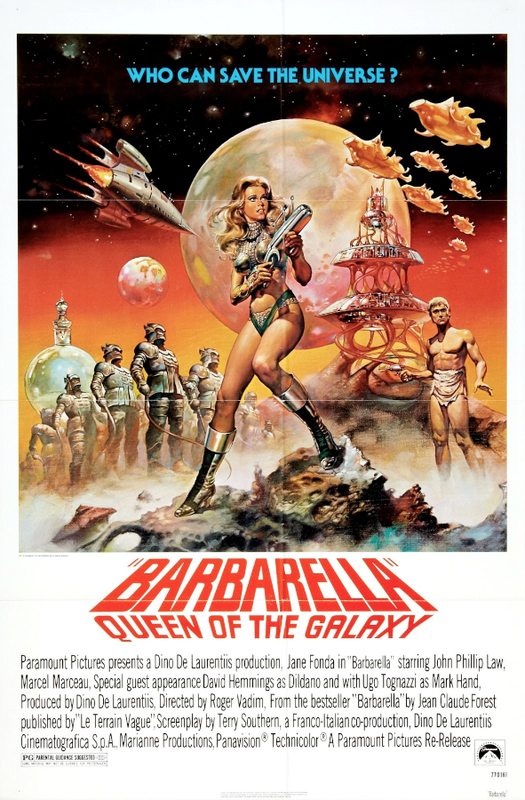 Barbarella and the Japanese Airforce, combine! It sees likely to me that they both were in play. I’m going to include some Zaku drafts again, that trace an evolution of the design. It’s funny how little these two designs look like each other at first glance, but there are some similarities that carry through from one to the other. On the earlier sketch, the wide smile-like grate and circular vents to either side of the mouth-grate give it a strong sense of, for lack of a better word, sideways-ness. It’s an emphasis on the lateral axis that I think shows up in the later Zaku head designs, there created by the conduit piping running from the nozzle grates around to the sides. There’s also already some basic shape taking form with wide hips, slightly narrower waist, and a broad chest again. This might be where Okawara’s business suit influence is showing up. The attitude or mood of the sketch, with the face’s angularity and narrowed eyes feels reminiscent of the Gouf’s or even Gelgoog’s more fierce faces. But that split visor is right there on the Zaku I. Also, I wonder if the the up-pointing ornamentation in the sketch has a faint echo in what I lovingly call the Zaku I’s cowlick (that funny fin at the back of its head). Early on I despaired of connecting BSG to Gundam directly; the search was not fruitful. I figured because of production and import schedules that there wouldn’t have been opportunity for cross-pollination. It’s not a smoking gun connecting the Cylon Centurion to the Zaku yet, because there aren’t any Centurions in this two-page spread. But it does mean that there was already cultural exchange and knowledge of Battlestar in Japan at the time, which means that pulsing, sweeping Cylon eye could have influenced Tomino and Okawara. When I saw this I immediately went back to Mandarake to get more back issues, specifically those from the end of 1978. Issue 2 was unavailable, but I did get issue 3 from October. It does have Centurions. Lots of Centurions. 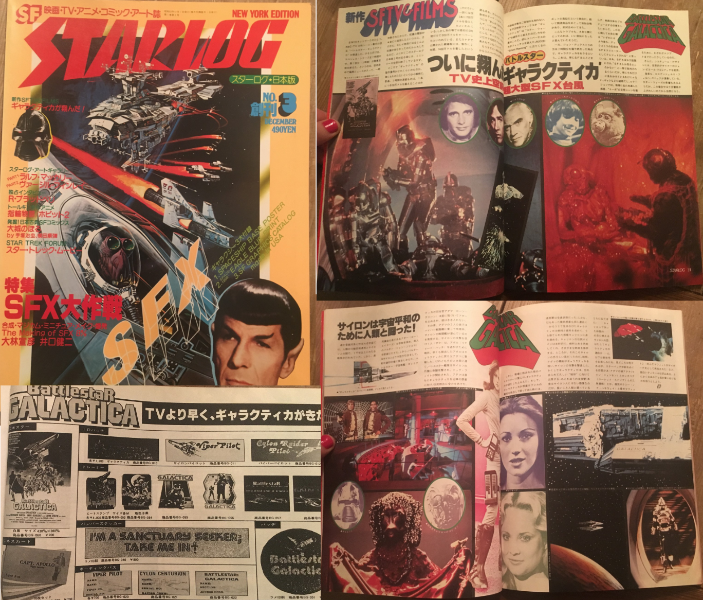 I would be more than willing to bet that there were images of Cylons showing up in other Japanese sci-fi media as early as October, and possibly even August with the first issue of Starlog came out. And, there’s no guarantee that Okawara got the first issue of Starlog immediately on release (I’ve also not been able to find production timelines for Mobile Suit Gundam to get an idea of when the Zaku design would have been finalized). I’m not trying to say that Okawara and Tomino plagiarized the design here, not by a long shot. 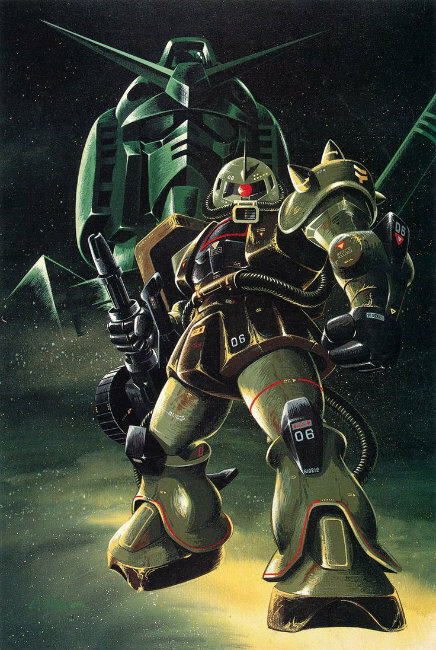 I think that given the number and variety of influences on the Zaku design, it’s pretty clear that the Zaku’s design is unique and powerful unto itself (basically the thesis of the excellent Zimmerit article. Seriously. Go read it). What I do find interesting though, is that two incredibly iconic villains showed up in the same year, and shared a very specific character marker: their monoeye. And most interestingly, they use that marker to convey very different things about themselves and their danger. When you work with theatrical masks, you talk about how a mask ‘plays’. Different masks ask performers to act in certain ways, which is why Arlecchino (predecessor of the Harlequin, and very much alive in characters like Batman’s Harley Quinn) pushes performers to very precise, exaggerated, sometimes extraneous, fast, and overblown movements that usually create comedy. The Joker’s two faces… I’ll see myself out. Given the similarity of the Zaku and Cylon Centurion’s masks at the level of their physical construction, I find it useful to think about their differences in terms of the way their monoeyes play. The Centurion’s simple sweeping eye makes it seem truly alien to us. When we humans scan our environment and look around, it’s a series of focal points. Our eyes move, dial in, and perceive for a moment. Then we repeat. The Cylon’s constant and un-mammalian sweep is almost the opposite, and I think one of the reasons they are so imposing and unnerving as villains7. The Zaku on the other hand moves and focuses its eye in discrete movements much like we do, but here, it’s the lack of a second eye that really gets under the skin and communicates danger. Having a single, expressionless eye ignite and swivel to focus on something communicates a singularity of purpose that is often associated with predators. It evokes the image of a tiger stalking prey, its head staying perfectly level and still even as its body rises and falls with its steps and the terrain. For the Zaku, having a single eye communicates that it is fully focused on whatever it is looking at. This has been a very interesting dive into the background of the Zaku. When it all started, I had the idea that there might be a connection between the Cylon and the Zaku. 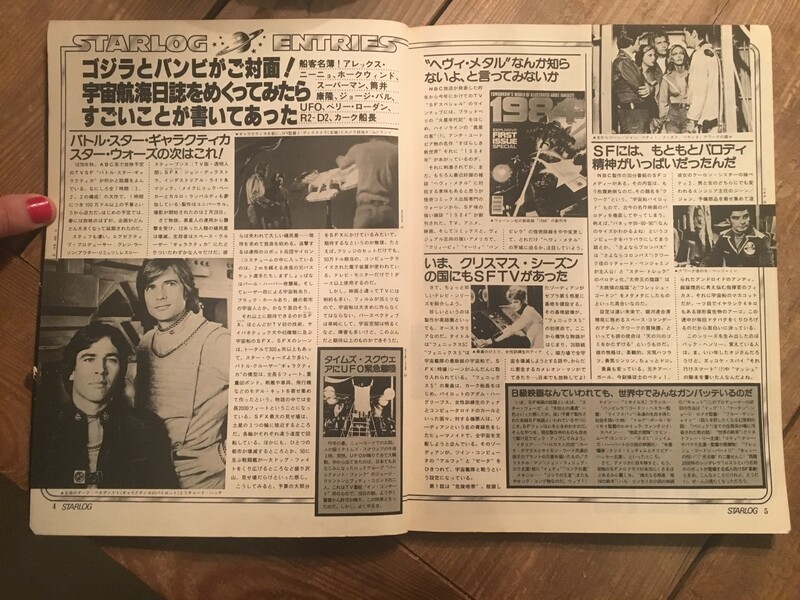 I still can’t be 100% sure that that’s the case, but considering the timing of when Battlestar was being promoted in Japan in relation to when Okawara was looking at Starlog issue 1 for inspiration, it seems likely to me that the Zaku is in a conversation with the Cylon. Tomino is too canny and creative a director for this to be anywhere close to the realm of plagiarism. He has a history of taking established tropes and doing something new with them (what else is Gundam if not a reinvention of the mecha anime, using an existing set of symbols to tell a very different story?). If Tomino did see the Cylon before telling Okawara to give the Zaku a monoeye, and even if that was what gave him the idea, all we need to do is look at the difference in the stories that these two monoeyes tell to know that Tomino is reinventing a symbol to tell his own story. Where the Cylon’s eye creates danger by being sweeping and inhuman, the Zaku adds articulation and a more human play to its mask, and achieves a much more familiar kind of danger–the danger we sense in a mind that we can fathom, through its more familiar play. They’re both fascinating evolutions of Gort’s eye, and maybe even HAL’s. Beyond the eye, I did not expect the variety of influences on the Zaku’s design that I found. That it combines Barbarella’s stormtrooper, JAAF flightsuits and gasmasks, and even business suits, is surprising. And the ability to trace those through the versions of the Zaku, and even into the Gouf and other mobile suits, is very cool. It all comes together into a design that has stood up for 40 years. If you spend enough time in Gundam fandom, you often hear that it is as influential in Japan as Star Wars, and the Zaku is a big part of that. Unlike so many other mechanical designs over the years, it is still relevant and compelling, and I think that its real-world links, and the story that its single articulating eye tells are a big part of why it sticks in our minds and imaginations.